After placing 8th in the Philadelphia qualifier round of American Ninja Warrior, Marshall University student Tyler Cravens said he knew he had more to give. 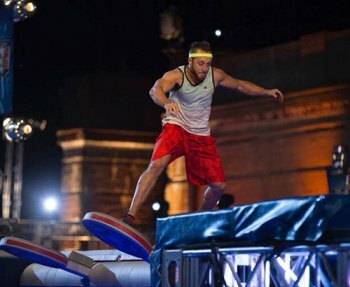 In hopes of winning, he will return to the arena for the 2017 season of American Ninja Warrior, an obstacle course race on NBC that tests competitors’ strength, agility and climbing ability. Cravens, a 27-year-old exercise science student from Chesapeake, Ohio, said competing on the show has helped him grow personally and gain more confidence. He will compete in the Cleveland qualifier round with the episode’s air date scheduled for late June. Cravens said he would like to give special recognition to his Chesapeake community, his family, his girlfriend and the faculty members at Marshall University who allowed him to take his finals early last semester to prepare for the competition. He also recognized Michael Nowoslaski and his family who made it possible for him to compete in the Cleveland region. Follow Cravens’ journey on American Ninja Warrior by following him on Facebook or Instagram: @tyler_cravens1. To learn more about the exercise science program housed in the College of Health Professions, visit www.marshall.edu/cohp online.